What is vibrating table? Why is it used? Who benefits? How different manufacturers make use of it? These are the very many questions that arise upon reading the words “Vibrating Table". Congratulation!! you have reached the web page of leading manufacturers, suppliers & exporters in varied kinds of vibratory table sales. Star Trace Pvt.Ltd situated in Chennai, Tamlnadu, India has rich experience in the field & is an unprecedented leader among all manufacturers, suppliers & exporters. Adhering strict quality norms, very low or nil maintenance, durability, cost effective & reliable are qualities which has peaked our sales. Sales of compaction tables have been topped by us for consecutive years. Let’s discuss vibrating table in detail. Vibrating table is also called vibratory table, compaction table & vibratory compaction table. Though naming may be different the methodology and working is one and the same with slight variations as applicable. Modestly designed vibratory table looks almost similar to our work table. The sturdy table structure has vibratory table top. Initiation of vibration is made possible by a motor set just below the vibrating table. Switching on vibratory process starts when any object placed on the vibrating or compaction table undergoes shaking vibratory movement for which it’s designed. On / off control for unit is at easy & conveniently reachable distance on compaction table. 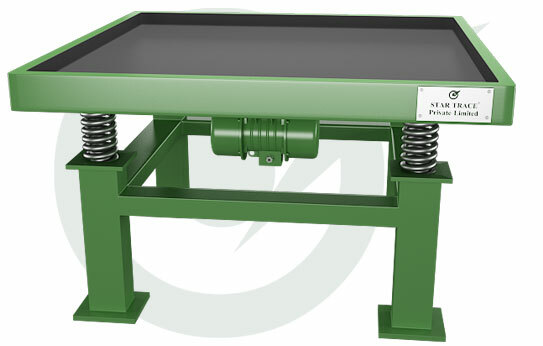 Vibrating Table body is made of steel ensuring strength. High tension industrial springs conveying efficient vibration. Vibrating Table motor with horse power matching model specification. Four foot pads provided to ensure perfect gripping to floor. Superior switches to withstand rugged use. Slightly raised vibrating table top to prevent falling off from table. Height for handling is set conveniently. The compaction table plays an integral part in concrete mold making / paver block making. Vibrating table for concrete block is the equipment that confirms durability for pave blocks. How is this achieved? Upon filling molds with cement mixture it needs through shaking to release all the air bubble. If only the trapped air is let out before setting or hardening, the blocks have maximum strength else will break. The vibratory table aids in bringing out a superior product. Sales of vibrating table for pave block have a lot of scope in this segment. Compaction is not only needed in small sized pouches or boxed but also when handling large volumes. Large volumes of minerals or saw dust or anything which needs to be transported will be packed in big wooden / cardboard boxes, drums & sacks. vibrating tables specially designed for this purpose should be put to use. What variations are to be done to fulfil the requirement? Height of vibrating table should be low. lifting heavy gunny bags or boxes high is practically not possible hence elevation has to be reduced. vibrating table motor must be conveniently positioned with out hindering movement.Vibrating table or compaction table length and breath have to be re-sized to comply with container. Manufacturers on discussing requirements with client will have better understanding & the sales will have better impact. Manufacturers,suppliers and exporters do not limit the use of compaction table to dry substances, semi solid or mushy products like sauces, purees,juice concentrates, pastes, paints etc. undergo vibratory process to occupy full capacity & enhance compactness. Contact our friendly & knowledgeable sales personals stationed at Chennai,Tamilnadu (India) & have detailed discussion pertaining your requirement. Branch offices in India and overseas can also be contacted for inquiry.